WIP Wednesday Bonus Fun Aurifil Block! The Splendid Sampler Block 28 by Charise Randall from Charise Creates was released this past Thursday. It is an adorable paper pieced dress, spool of thread and needle with a very sweet story. To make the Aurispool was not a difficult change to make and it turned out absolutely perfect! I drew little lines on my pattern to create this block but Charise, being the FABULOUS designer that she is, offered to make a pattern so you will not have to guess and draw the lines yourself! Thank you Charise! To get the BONUS pattern for the Aurifil Block visit The Splendid Sampler! After making this block you will have the paper piecing bug! It is addictive! Visit Charise Creates website to see MORE of her wonderful patterns! 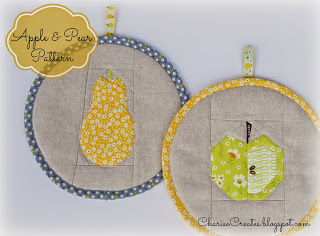 Charise also has some free patter like this Apple and Pear that is a PERFECT beginner paper piecing pattern! Hope you have been joining in for all of The Splendid Sampler fun! This FREE sew along organized by Pat Sloan and Jane Davidson from Quilt Jane is a year long event with 100 ( did I mention FREE) quilt blocks! The Blocks are released every Sunday and Thursday and have a beautiful detailed PDF for you to download. 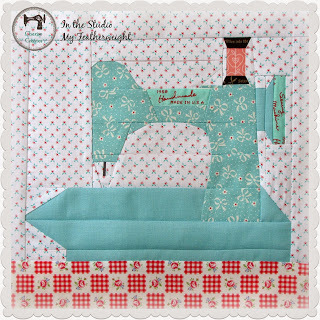 This sew along has every style of quilting and handwork too! It is a great skill builder series for anyone. Such a clever gal! And, yes, I do like Aurifil but seem to have gathered more Glide than Aurifil (although, using Aurifil for piecing is really wonderful!). You're sure correct about the "lint factor". If cotton thread is your choice, Aurifil is the ONLY choice!!! !